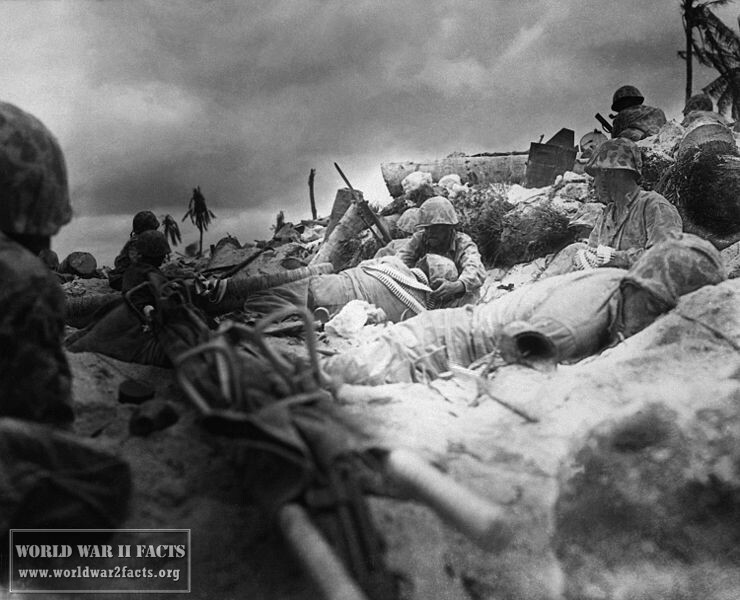 The Battle of Tarawa occurred between November 20th and November 23rd, 1943 in the Pacific Theater of World War 2. This battle was the first in the series of the American offensive island hopping attacks in the central Pacific. Tarawa would be the first time in World War 2 that the United States Marine Corps would face significant opposition from the Japanese to an amphibious landing tanking on 4,500 well supplied and entrenched Japanese defenders. In just over three days of fighting mthore than a combined 6,000 Americans, Japanese, and Koreans would die on the island in brutal fighting. 1 Why Did the Battle of Tarawa Occur? Why Did the Battle of Tarawa Occur? 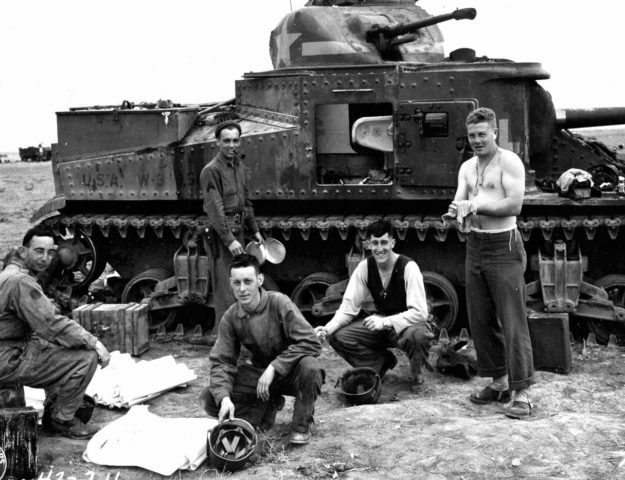 Lt Alexander Bonnyman (4th from right) and his assault party storming a Japanese stronghold. Bonnyman received the Medal of Honor posthumously. were heavily defended and would require land-based bombers for the Americans to have a shot at victory. In order to start an attack on these islands, however, the road to invasion had to start far to the east at Tarawa. 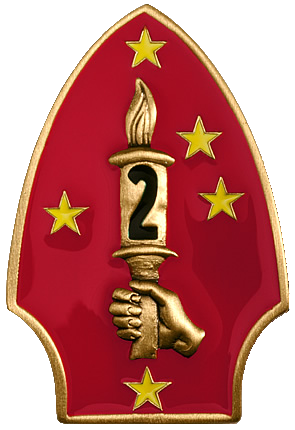 The insignia of the 2nd Marine Division "Follow Me". The invasion force for the Battle of Tarawa consisted of 17 aircraft carriers (6 CVs, 6 CVLs, and 6 CVEs), 12 battleships, 8 heavy and four light cruisers, 66 destroyers, and 36 transport vessels. The landing force consisted of the Army’s 27th Infantry Division and the USMC 2nd Division for a total of 35,000 Marines and soldiers. The battle would commence with naval gunnery on November 20th, 1943 that would shell for more than 1.5 hours with a brief respite for carrier-based dive bombers to strike targets. The invasion plan called for three major beaches on Tarawa to be designated Red 1, Red 2, and Red 3 along the northern coast of the island with Red 1 being on the western toe of the north side of the island. The Green beach was the western base of the island and black beach was the southern shore but were not considered suitable to conduct a beach landing. The Japanese runway divided the island into a north and southern half. Marines seek cover behind a sea wall on Red Beach 3, Tarawa. 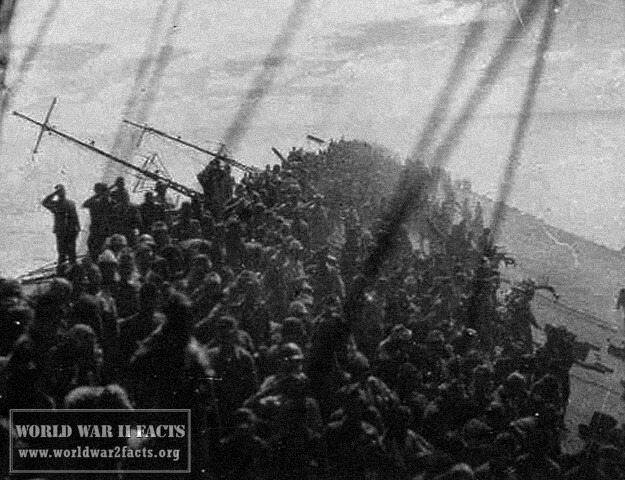 The initial invasion commenced at 0900 local time a tad later than expected and saw a number of Marines stuck on the reef approximately 500 yards off-shore. Planners had expected the rising tide to provide a 5 feet depth over the reef, however, the neap tide being experienced did not provide this much room to spare in most cases being only 3 feet over the reef. As a result, a number of navy boats that were caught on the reef were brought under fire by Japanese mortars and artillery with a number of Marines forced to wade ashore under intense fire. Out of the first wave, only handfuls of men were able to make it to the beach. 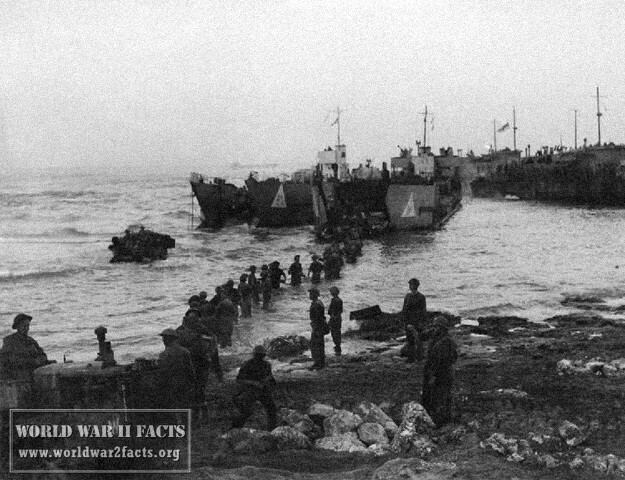 Eventually, the Marines initial line began to move inland by 1530 but the arrival of tanks started to help it get moving along Red 3 and the end of Red 2 beach. By nightfall, the Marines had moved the line about half-way across the island close to the Japanese runway. Throughout this time, they continued to take harassing fire seeing a large number of casualties on both sides. On the 2nd day of the invasion, the Marines focused on cutting the defending Japanese forces in half. They expanded the bulge on the airfield until they reached the southern shore. 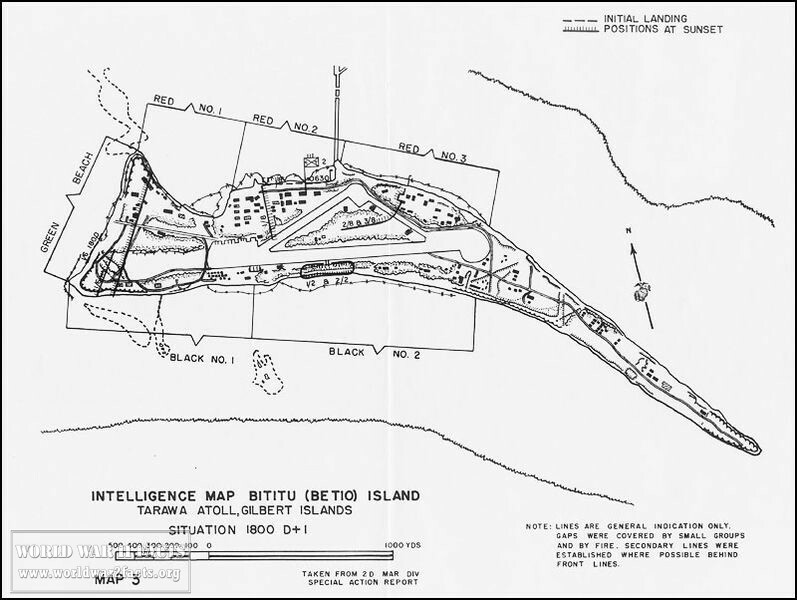 At the same time the Marines on Red 1 were directed to secure Green Beach. They would use Nava gunnery to help inch forward during the day and used artillery spotters to help take out the remaining Japanese defense and did not experience a significant number of casualties as compared to the fighting on the rest of the island. During this time, the Marines on Red 2 and Red 3 saw significantly more fighting on the 2nd day running into new machine gun posts which cut off friendly forces from each other during the day. By mid-day, the Marines had amassed their own machine guns, and were able to cross the airstrip on Tarawa. 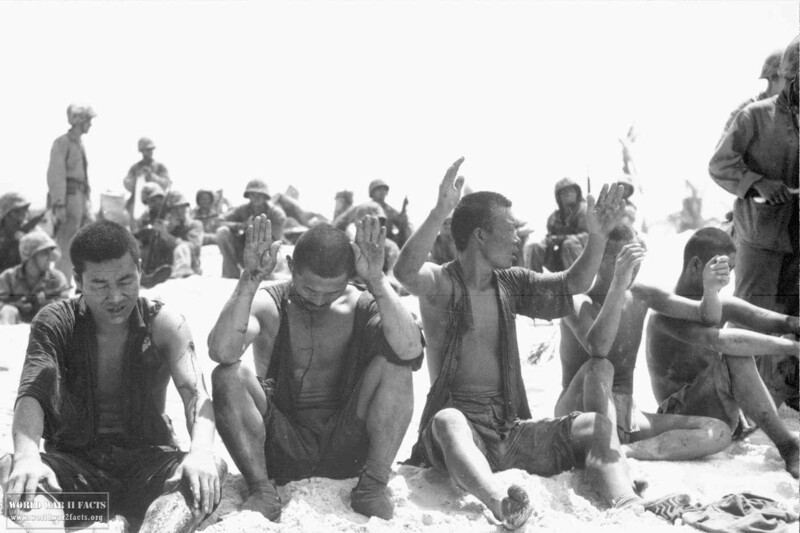 During day 2, the Marines also moved to cut-off Japanese attempting to escape to Bairiki. During Day 2, the Japanese atoll commander, Kaigun Shōshō Keiji Shibazaki, was killed in his concrete command post. On the third day of the battle, the Marines focused on consolidating their existing lines, and moved heavy equipment onshore. By the afternoon, they were then pursuing the Japanese across the southern part of the island and reached the eastern end of the airfield. By the evening, the Japanese started to form for a counterattack, eventually making some progress by the evening, however the Marines would wrap up taking the island by the fourth day of the invasion. By the end of the battle, there was only one Japanese officer, 16 enlisted men and 129 Koreans were alive at the end of the battle. The 2nd Marine Division suffered 894 (48 officers and 846 men) killed in action, with another 84 (8 officers and 76 men) later dying of their wounds. A further 2,188 (102 officers and 2,086 men) men were wounded. 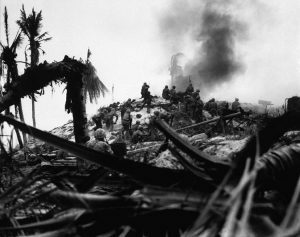 Of the roughly 12,000 2nd Marine Division Marines on Tarawa, 3,166 officers and men became casualties. The Battle of Tarawa would be the first of many amphibious landings made by the United States Marine Corps during World War 2. One of the greatest factors to arise out of the Tarawa Campaign, was that it helped convince the American public that they had a long, and bloody road ahead of them before victory would be achieved over the Japanese. The photographs of the numerous, dead Americans on the water’s edge would take back the public who had not been exposed to the gruesome details of many of the battles in the war. In just 4 days, there were almost 1,000 Marines who would lose their lives with a long way to go to get to Tokyo. As the main Atoll in the Gilbert Islands, Tarawa would mark the first step across the Pacific on America’s offensive in the Pacific Theater of war. "Battle of Tarawa," Wikipedia Entry. Accessed March 9th, 2013. "Operation Galvanic (1): The Battle for Tarawa November 1943". History of War. 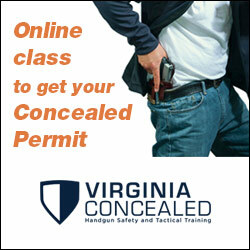 Accessed March 9th, 2013.